My favorite flower is the peony, but I also love tulips. The very first experience of gardening in my life was planting tulip bulbs in the flower pots when I was about six. I didn’t become an avid gardener or anything, but I still remember how exciting it was when the shoots came up a few months later. I’m more conscious of loving flowers in recent years. Some years ago, very suddenly I started noticing and taking pictures of flowers when I was going for a walk or visiting friends. When people talk about sexism, it’s mostly about prejudice against women, but when it comes to flowers, it seems that people tend to assume flowers are for women. Many men are also into gardening; growing roses, dahlias and all kinds of flowers, but as for cut flowers, most people seem to assume they are for women. I wonder many men might feel it’s not very manly to admit they love flowers. About an hour drive north from Seattle, the town of Mt Vernon is famous for tulips. 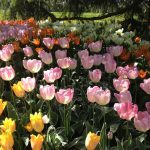 This region grows more tulip bulbs than anywhere else in the U.S., and the Tulip Festival there in April draws hundreds of thousands of people every year. The first time I saw their spectacular carpet of colors in a huge landscape was when I was in college. 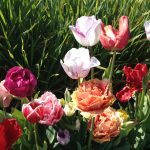 I went on an overnight trip to Lopez Island with my Spanish classmates, and on the way back to Seattle we drove through the area when it just happened to be the peak blooming season of tulips. 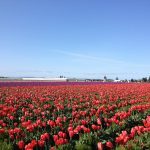 I didn’t know anything about the humongous tulip fields of Skagit County; it was totally unexpected and one of the most delightful surprises of my life. Since then, I went back to Mt Vernon to take pictures of the tulips a bunch of times. A number of years ago I drove there by myself and spent more than three hours taking pictures of the display garden in one of the farms, and writing down the cultivars I really liked. After a careful scrutiny, I picked seven varieties out of dozens and dozens, and decided my favorite was a rather short, double cultivar called Angelique. It’s like a little peony and I loved the whitish pink color (which I don’t know if I should admit that is my favorite flower color, and risk sabotaging masculinity). 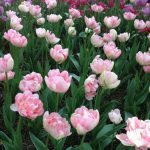 A few years later, I was reading an article about the most popular tulip cultivar in Japan, and it was…. Angelique. Without having known much about tulips, spending hours taking notes and comparing, and after all my conclusion was exactly the same as them. I became an adult in the U.S. and in many ways I could be more American, but my aesthetics must be much more colored by Japanese sensibility. I haven’t gardened all that much in my life, but did get into it for some years around the year 2000. I planted tulips in pots every year for several years. One year I planted 600 bulbs, including those tiny bulblets, each of which just shoot up a long leaf and bear no flower. I’ve heard it’s not easy to propagate tulips, by planting those little bulbs and harvesting bigger bulbs every year for 4, 5 years because of the virus. I tried to do that for Angelique, but the following year, most bulbs did seem to get some kind of a viral disease. After many years of not gardening, I started planting tulip bulbs again two years ago. The excitement of seeing the pointed green shoots coming out of the ground and observing the growth everyday is not all that different from when I was six. I would think having every kid experience planting and caring for flowers or vegetables has to be absolutely valuable and much more educational than studying for tests in the classroom. 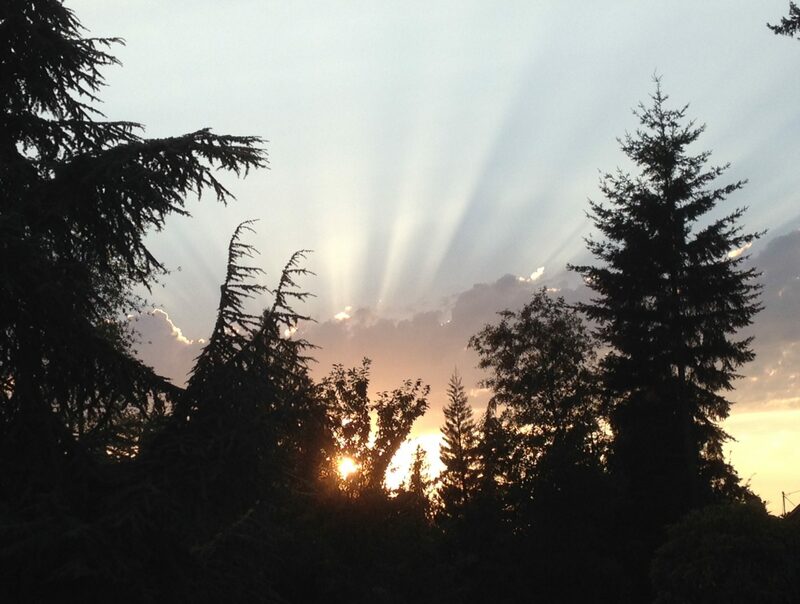 One of my dreams is to have a small garden, grow lots of my favorite flowers and give them away—to both women and men. Next PostNext Are “Old” People Old?